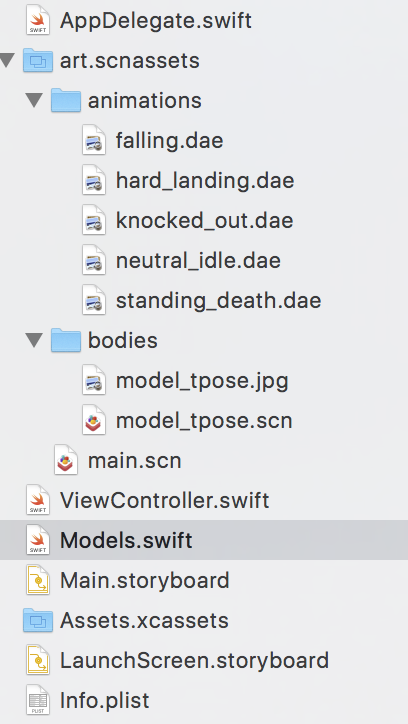 Using SceneKit, what I am trying to achieve is to keep t-pose character model files and animation files separate so that I can load them on runtime. I have prepared my model files, which include both mesh and rig in their respective root nodes. I have also prepared the animation .dae files. These are all created in Blender and animations are exported from mixamo. Animation .dae files only contain rig nodes. I have successfully loaded them into my scene and applied the animation selected. Please don't mind the different file names in ScreenShot and the code above, i was just trying to show information about my issue rapidly. Browse other questions tagged animation scenekit mesh collada skinning or ask your own question. How can I export a simple rigged model from Maya for use in Scenekit?